Bluetooth speakers liberate you in more than one ways, but how many times have we come across a speaker that sounds astonishing for its size and doesn’t break the bank at the same time? A combination that has been difficult to achieve has been struck by a product that comes from a brand that is synonymous with high quality audio. 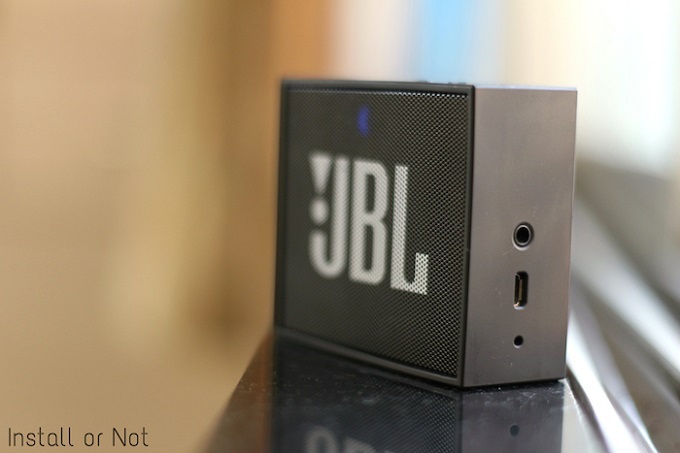 Harman International introduced the JBL Go at CES and it probably introduced what we call the ‘Best Value Bluetooth Speaker’. These are the factors that drive the product to be so compelling. The JBL Go is very industrial in design – we get it, Bluetooth speakers should be portable enough to throw in a backpack and bring it along anywhere you can imagine. 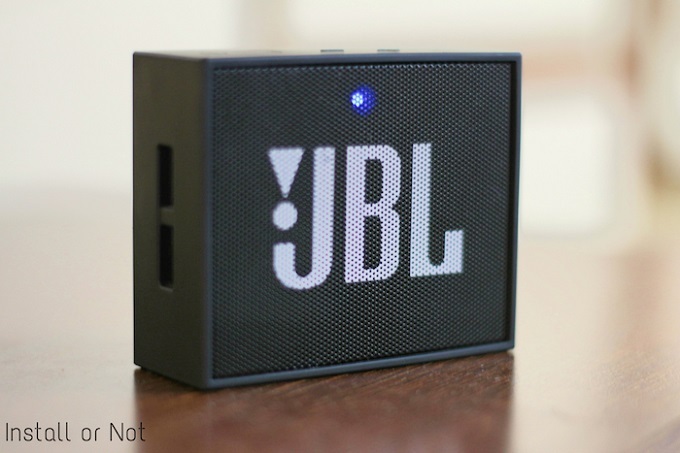 The JBL Go is all that and is very simple in design. 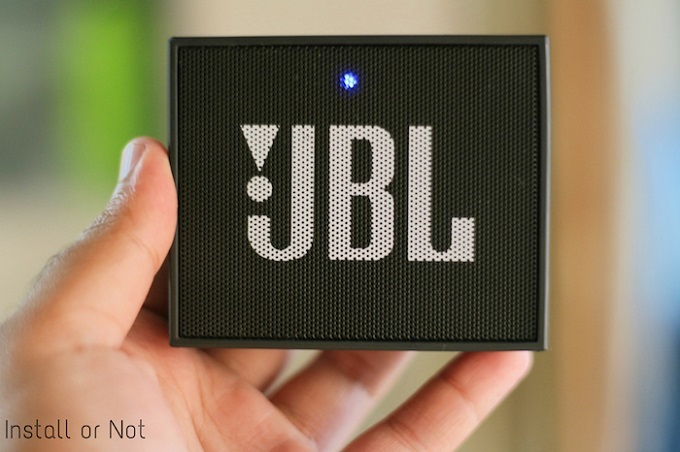 It looks like a shrunken down version of the huge concert style speakers with its matte black grill and big bright JBL logo on the front. The whole body has a rubber like texture to it so it has good grip. The rear is completely sealed and flaunts a similar logo. The top has a set of buttons on the top that are all the controls you get, in one place. Some buttons are recessed and some are embossed above the surface. The point is that feeling them would give you an idea of which control you are at. The set of buttons include a power on-off button, a Bluetooth connect and disconnect button, volume down and volume up and a call answer/reject button. A noticeable addition is that off a microphone and not any mic, it is a noise cancellation microphone – just like the one on most smartphones so your audio calls do not have to suffer. There is also an auxiliary port present so you can connect a line out to your car or any other amplifier and stream music seamlessly. A microUSB port is available for charging. 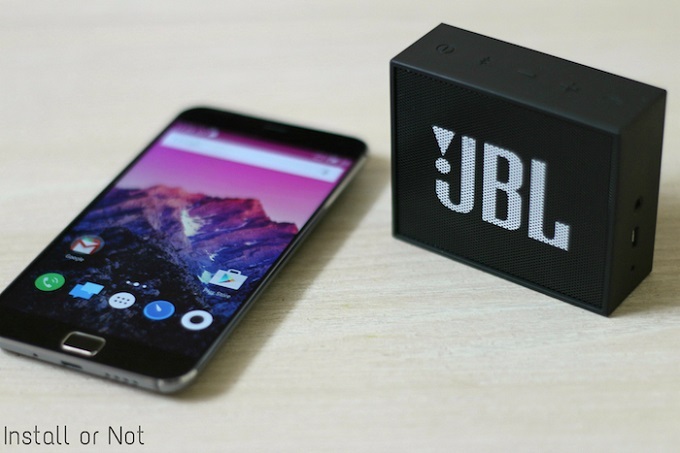 We tested the JBL Go over a period of two weeks. 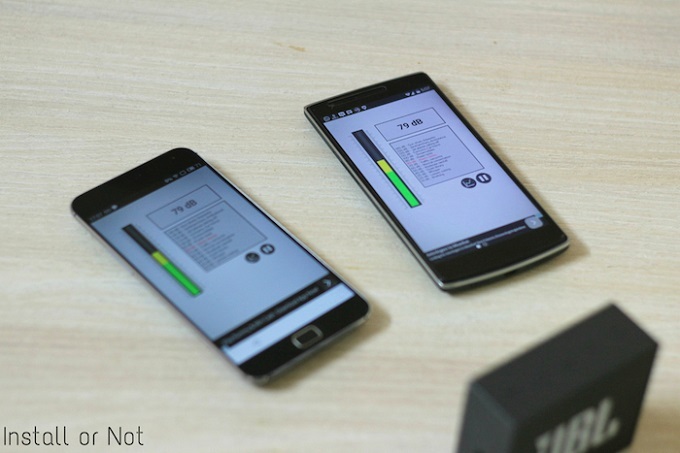 The Go was charged twice over the period of two weeks which says a lot about how good the device holds charge. The JBL Go is powerful enough to fill a normal sized bedroom but it was reasonably loud in the hall room as well. Sound delivered in our tests showed a peak max of around 90 dB but usually hovers around 80-85 dB. This was with a good amount of ambient noise since we wanted to test in a day to day scenario. 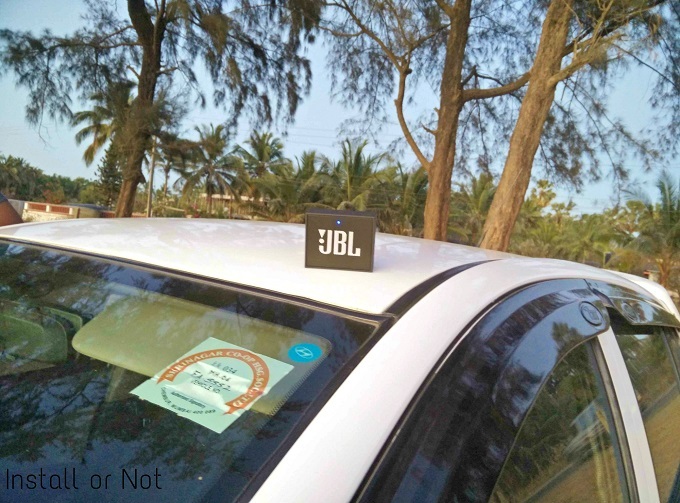 We also happened to take the JBL Go over a road trip and used it to power a small beach party as well. The sound surprisingly held up without getting lost in the breeze. The speaker has one single LED in the middle and it is multicolor in nature. Blue is the color that can be seen in normal usage. A blue blinking indicates that the JBL Go is ready for connection. A red color indicated low battery and the speaker would typically last for 30 mins after it enters the critical battery state. 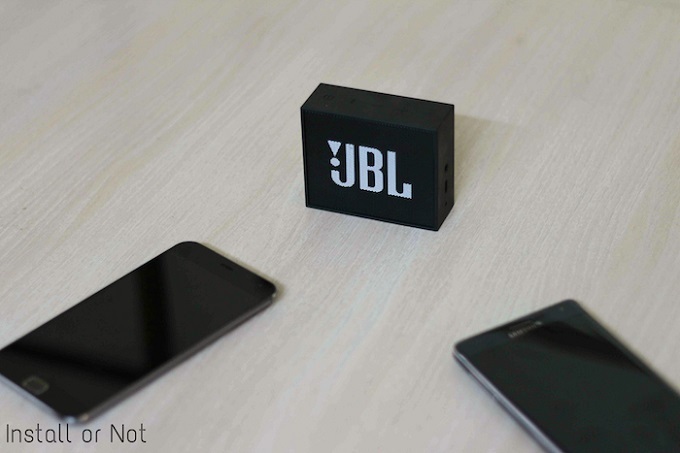 With a 600 mAh battery on board, we found out that the JBL Go lasts for around 5-7 hours depending on how loudly you are cranking the volumes. Even if the volumes are cranked to the highest, the sound coming is punchy and full. We have been testing a lot of Bluetooth speakers but nothing this small and portable in size can produce such full sound. We have to agree, the lows are present, mids are crisp and highs are just as much as we would have liked. It has a power output rating of 3W and is built using a 40 mm transducer, but what really matters is the sound and the experience that this tiny monster can deliver. 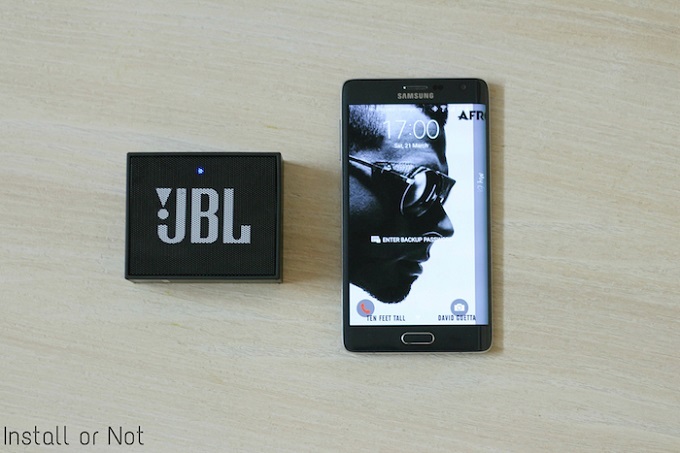 The JBL Go can be concluded as the Bluetooth speaker that ticks all the right boxes. Is it portable, sounds really good, doesn’t slip around with its tiny rubber feet and industrial body, but most of all it crushes the competition by delivering all that for just Rs. 2000. If you are in the market for a Bluetooth speaker and want a hastle free experience without spending a lot, we advice you to look no further. The JBL Go would have been our most favourite option if it had the capabilities to pair up with other JBL Go’s and create a multi-speaker arrangement but that is us nitpicking when the device does everything we expect it to. Oh and also, you get 1 year of warranty if your device is to behave in an unexpected way.